The New Fantasyland expansion of the Magic Kingdom has come a long way since it was first announced at the 2009 D23 Expo, not only in construction, nearing its grand opening later this year, but also in terms of what experiences guests will enjoy within. Over the past three years, Walt Disney World has made major modifications to concepts of what would be included in the new area, dropping and adding major components based on fan feedback and reevaluation of what they considered would be the most entertaining attractions. 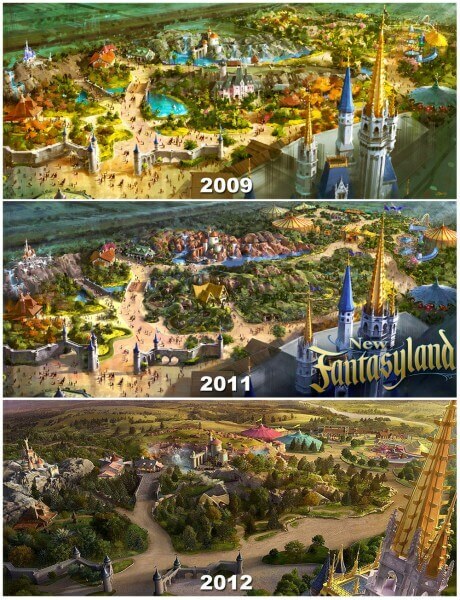 It’s interesting to look back on and compare the concept art Disney has released, showing the changes made to the expansion design, some subtle, some not so much. Click to enlarge each of the images below and take a closer look. When first announced, New Fantasyland included many of the elements that remain part of the expansion today: Be Our Guest restaurant and a surrounding “Beauty and the Beast”-themed area, a ride based on The Little Mermaid, and the relocation and enhancement of Dumbo the Flying Elephant. But a variety of elaborate Disney Princess meet-and-greet opportunities were also part of the project, each located within individual princess cottages, including Snow White and Aurora (Sleeping Beauty). 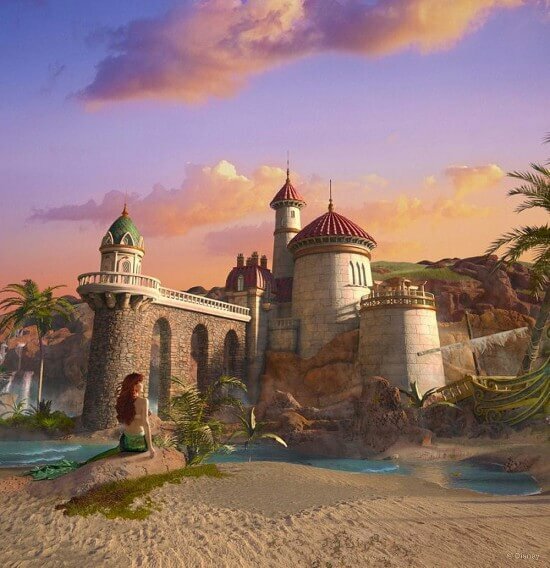 Also included was a large Disney Fairies area dubbed Pixie Hollow to be completed as the expansion’s last phase. Fans quickly voiced their concerns with parts of this princess-centric expansion and in the months that followed, Disney heavily modified their design and artwork. The finalized concept for New Fantasyland, ready just in time for the 2011 D23 Expo, replaced the princess cottages with the Seven Dwarfs Mine Train, an inventive roller coaster featuring Imagineer-created rocking ride vehicles. Storybook Circus became the new home for Dumbo, taking over the land previously earmarked for Pixie Hollow. Not depicted in the artwork is Princess Fairytale Hall, retaining the original princess meet-and-greet concept but moving it into one central location, replacing the now-closed Snow White’s Scary Adventures ride. Now, with construction drawing close to completion on the Fantasyland Forest (or Enchanted Forest) section of the expansion and a grand opening date set for December 6 of this year, Disney has released what they’re now calling “signature images,” including an updated version of the overview concept art they’ve been using to show the entirety of New Fantasyland in one all-encompassing picture. While retaining the same basic elements as the most recent concept art, the new “signature image” offers a far more idealized view of what the expansion will look like when completed, showing concrete walkways instead dusty paths and replacing the real-life backstage areas, roads and apartments behind the Magic Kingdom with scenic rolling hills and mountains, certainly not part of any Florida landscape, but definitely present in the imaginations of anyone who visits this fantasy-filled world. 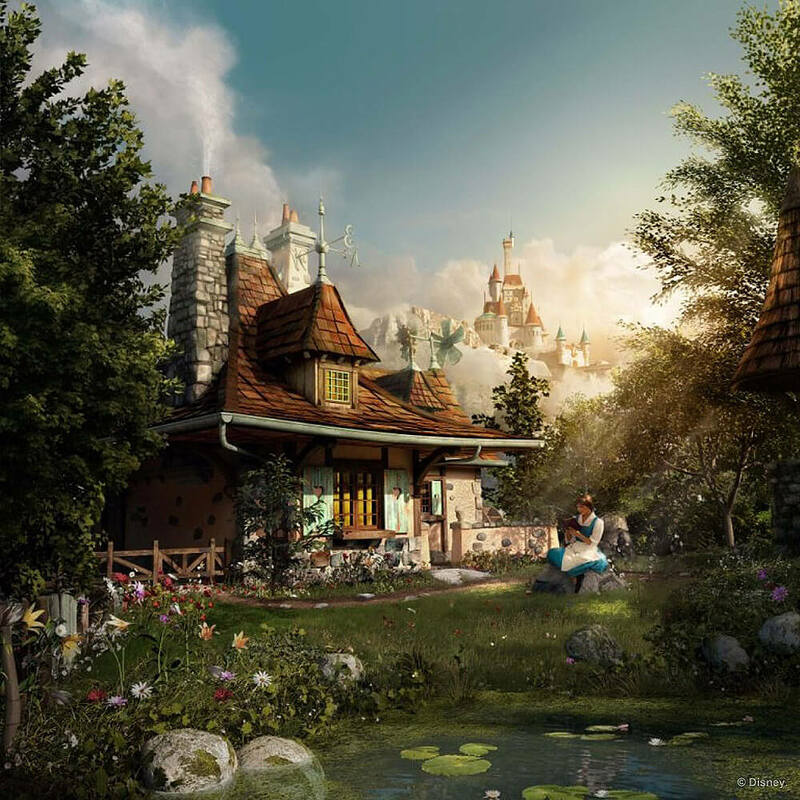 While the entirety of the New Fantasyland expansion won’t be complete until 2014 when the Seven Dwarfs Mine Train opens, the area’s grand opening will be held on December 6, 2012, with previews for all Magic Kingdom park guests beginning November 19. In just a few months, guests will finally begin to walk through the lush areas depicted in the artwork above, changed from its initial reveal a few years ago, but sure to be even more stunning in person. I still wanted the Pixie Hollow section. Would’ve made more sense than Adventureland. Wow, looks pretty dull at this point, not worth a trip from the west coast to the east coast. Hidden Mickey in the Belle’s Cottage Picture! yea i have to agree this land does nothing for me.Waste of time and money. I’m sick of people comparing the FLE expansion to Cars Land. This is not big enough, nor is it a legitimate contender to WWoHP. I think it looks great, I am excited to try out the coaster and see the restaurants but meet and greets have never been a draw for me, I would much rather go back to the characters wandering the parks like they did in days long ago, I realize though that this is just a fantasy and probably will never happen again because of the crowd levels.